Posted March 24, 2016 by admin . With your customers spending eight or more hours online every day, it’s no surprise that websites have become the digital storefront for businesses. Even small and local businesses need a website to be found by potential customers. Whether you sell products online with an ecommerce website or simply want to send people to your physical store, a website can be the difference between success and failure for small businesses. But having a website for the sake of having a website can no longer cut it for business owners. How do you know if your website is holding you back? Design. Image is everything. Your business website should reflect the brand, look, and feel of your business. The website must make a strong first impression. Message. You can’t use the same cookie-cutter template with the same generic content and expect great results. The content in your website must make your message clear to guide the visitor to the end result you want – to becoming your customer. Usability. People want to find the information they’re looking for quickly to get back to their busy lives. If your website isn’t user-friendly, even on mobile devices, they’ll leave and look for the answers from your competitor. Search. Search Engine Optimization continues to change and evolve. If your website doesn’t keep up, no one will be able to find it. How do you know if your website is holding you back? There’s more to the story… read the full article at Mobile Marketer: Is your Website Holding you Back? Pediatric Endocrine Associates had a dated, stale, ineffective website. The design was boring, consumers couldn’t find the information they needed, the website wasn’t ranking… all this meant that the business wasn’t performing where they needed to be. With a brand new website design from our team of qualified web designers and marketing experts, Pediatric Endocrine Associates broke free from the chains of a poor quality website that was holding them back and launched to new heights. 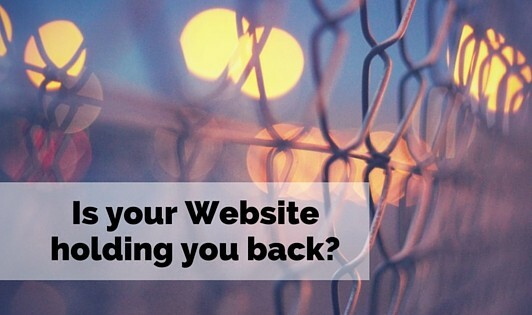 So ask yourself: Is your website holding you back? To find out, call our team of experts at 303-703-8000. We’ll offer you a free website evaluation and make recommendations based on your business, your customers, and your competitive environment.